So I went to New Orleans for New Years Eve. It was a magical trip, with gothic cemeteries and cathedrals, public intoxication on Bourbon Street, and eccentric Voodoo shops and boutiques. I had a blast and visited many tourist attractions, which included the New Orleans Ghost Tour. Spoiler alert: I did not see any ghosts. 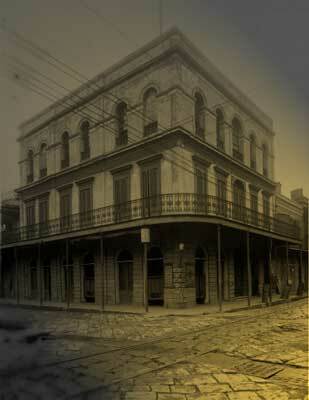 But I did see the infamous Lalaurie Manson where Delphine LaLaurie slaughtered and tortured dozens of African slaves. Those who watch American Horror Story are well-familiar with the Delphine’s historical bloodlust. When I stood outside that house I felt a terrible shiver. I wanted to get away from it as fast as I could. I didn’t feel an evil presence or anything like that, but as our tour guide spouted off all the gruesome events that happened there, I got more and more creeped out! The Lalaurie Mansion was the scariest part of the tour. I also visited the oldest and most haunted bar in America, Lafitte’s Bar. I heartily recommend the Hurricane: a pleasant cocktail made with fruit juice and rum. Very tasty! I got to sip on that while I walked through the French Quarter. New Orleans is supposed to be a hot spot for vampires, ghosts, Voodoo, and other paranormal activity. I didn’t see any of that–but I think I did meet a white man who wanted to mug me! I knew he meant me harm, and yet I was very much attracted to his lazy, Louisiana drawl and the predatory glint in his eye. He said as we walked by, “Hey, can I have that bag?” But I knew he meant it, and had I been alone, he would have tried to take it. He might’ve been a vampire, I don’t know, haha! Anyway, I was disappointed by the weak selection of “magical items” in the Voodoo shops. Most of it just looked like fare for tourists, however I did buy a figure of St. Teresa de Avila. Mostly because she’s an important element in my novel. At any rate, the ghost tour was fun and I would recommend everyone try it at least once. Who knows…you might just snap a photo of a ghost!